Arsene Louis Garnier was a great photographer and his expert attention to detail is wonderful to see. He was born in France in 1822 and he initially travelled to Guernsey to take daguerreotypes for Guernsey clients. This venture was obviously profitable for him as he came back to Guernsey many times. He advertised that he was established in 1848. He also had a LETTERS PATENT for the invention of "AN IMPROVED PROCESS FOR PRODUCING PHOTOGRAPHIC PICTURES WHICH HE INTENDS TO DENOMINATE 'SYSTEME GARNIER DE PHOTOCHEROGRAPHIE COLORIEE.'" - being Patent Number: 488. This was sealed on the 24th August 1855, and dated the 5th March 1855. It is printed in London by Eyre and Spottiswood - His patent details have been tracked down and an original copy has been obtained by the author and it is shown here. Shown below are a sequence of 12 cdv back variations from the 1850's until the business closed - there possibly may be more – all known by the author are shown here. They are depicted in suspected date order with the images associated with them adjacent, but guesswork is the only criteria with the order - any further help would be appreciated. If any other backs are found and also If anyone has any cdv's with a handwritten date on please get in touch - thank you. Arsene Garnier, a friend of Victor Hugo was born on the 21st June 1822 in Saint-Pierre-de-Cresnay, Village de la Gauterie in France. He first setup business in Guernsey in 1848 ( though he may have travelled to the island earlier), where he initially took Daguerreotype photographs. Daguerreotypes were the first publically available photographic process and made good money as the demand and profit was good, being a relatively new invention (1839). When the invention went public, the process was not patented or licenced in France as the French Government bought the rights from Daguerre and gave it free to the French nation. However in England Daguerre licenced the process and 'Richard Beard' was the sole licensee therefore it is understandable that many photographers from France came over to the Channel Islands in the early years to take images where they had free rein as no English photographers other than Beard were set up to do so. The added bonus was that they were also closer! Arsene Garnier must have realised that like the other visiting photographers that St Peter Port in Guernsey was full of rich merchants and retired army personnel not to mention the Gentry; these services would have be keenly sought after. In the early days though the prices were high and business profitable, there was a limited market to aim for and there would not have been enough clientele to warrant him staying permanently. By the 1860's resident photographers instead of visiting ones were becoming the norm. Guernsey must have indeed continued to prove good business for Monsieur Garnier as it is known he made many trips back and forth from France until at least the mid 1850's after which it is believed he may have stayed more permanently on the island. In about 1850 he married a now locally based French girl called Julie Hallier (marriage details not known) and subsequently had two children. During his visits, he spent a few months at a time on the island and used to announce his arrivals and departures in the local press. These comings and goings by visiting photographers were normal in the 1840's and 50's..
Daguerreotypes though having fine detail had their limitations, one of which was that each one was a one off item and multiple copies could not be made without another photograph being taken and processed which was expensive. Another drawback was the image had to be protected by glass as the silver surface could be easily scratched and would eventually tarnish if it was exposed to the air. From 1848 until 1852 Arsene Garnier operated from 18 Berthelot Street in St Peter Port, he then moved to an area even nearer to his clientele, namely, 3 St James Street St Peter Port where he remained to at least 1879. At what date Arsene Garnier switched to collodion (wet plate process) and produced cartes de visite (cdv) is not known, but at a guess, it could have been in the early 1850's. In 1855 he took out his patents for his 'Garniers System of Coloured Photokerography', which proves he must have been using collodion (wet plate process) well before that. What is interesting is that Arsene's 'Provisional Specification' for his patent lists 'SYSTEME GARNIER DE PHOTOCHERGRAPHIE COLORIEE', either the 'ch' instead of a 'k' in 'Photokerographie' or 'Photokerography' is a mistake or Arsene Garnier changed his mind when he came to print his cartes de visite. Without a hand written note written by the purchaser on the cdv or further investigation into the cdv back logos (shown with this article) it is not possible at this time to be definitive with dates. What is known is that he was producing cdv's way before 1868 as one of the later cdv backs give this date incorporated in a logo showing he exhibited at the 'Channel Island Industrial Exhibition' and won a prize medal. Arsene Garnier appears to have primarily concentrated on portraiture, though it is possible he made non portrait images as well, if he did, they are not common and the author has seen only one and that shows the agave flowering in Victor Hugo's garden. 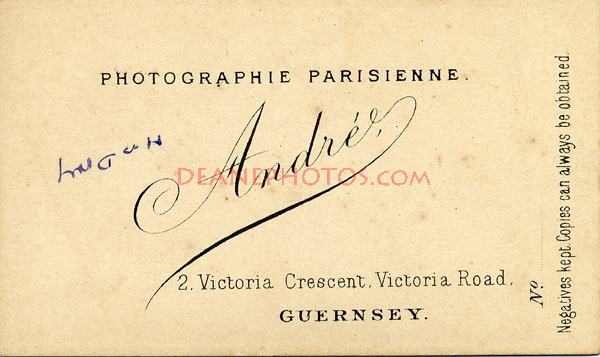 Arsene Garnier also used his prize winning logoed backs to advertise his business was for sale, one for £1,000 and the last cdv back printing mentions no price but states the business is for immediate sale. It is not known how long these 'For Sale' backs were in use; more than likely it started in about 1871 onwards. It is also not known at the time of writing whether his business was sold, or at what date. When he finally gave up the premises in St James's street is also not known. He is known as previously mentioned to be still operating in 1879 and maybe later as he is shown in a local almanac as late as 1879, however it has been established that he was living in France in 1881 where he had a house built. R. Dumaresq also a photographer was known to be operating from the same address (more than likely in the 1880's). R. Dumaresq then evolved into Dumaresq & Co, due to a takeover by Billinghurst & Smith of 16 Royal Parade Jersey and Weymouth. There is also another photographer listed as being operational at 3, St James's street in the late 19th and early 20th century, namely Henry J. Kaines who was operating from the premises on the 12th September 1900, the date of Arsene Garnier's death. Mike Deane has ascertained that there are at least 12 logo design back variations and there possibly may be more – all known are shown here. They are depicted in suspected date order, but guesswork is the only criteria with this - any further help would be appreciated. Thanks must go to Cyprien Gesbert and Stephen Furniss for enlightening the author or confirming some relevant dates and facts mentioned by him in the above article. Shown below are some more images with their associated backs. Standard 'Prize Medal' printed back.